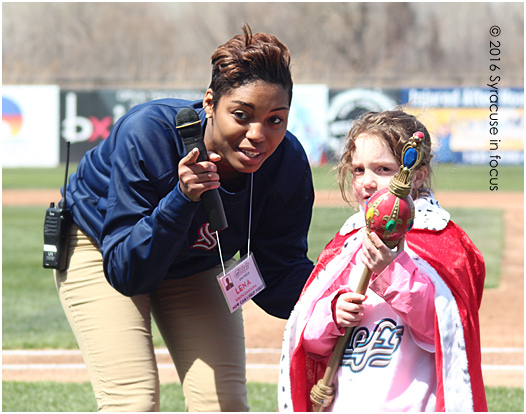 New Chiefs on-air personality Lena Pringle (left) prepares a young student to be Queen for a Day at NBT Stadium earlier this month. 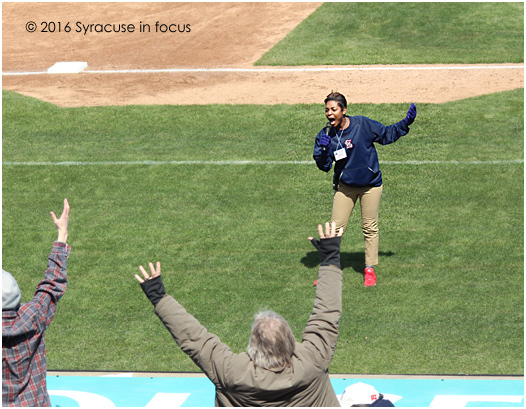 The start of baseball in Syracuse signals spring and new beginnings. Despite the team’s record in April we are always hopeful. 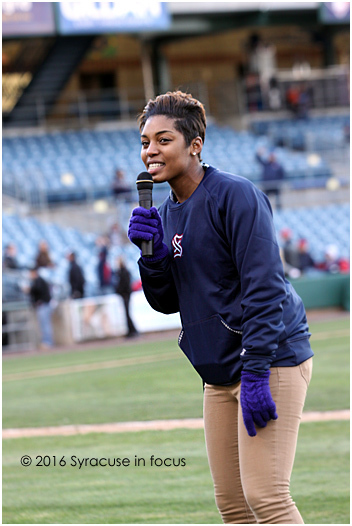 This year the Syracuse Chiefs did a great job selecting SU grad student Lena Pringle as the on-air announcer. Her spirited attitude and passion for the team and our region are just what we need in times like these. Sometimes we need to see someone else zealous about the things we take for granted. If Jason Smorol is Mr. Excitement for the Chiefs, Pringle is definitely Ms. Enthusiasm. In business we’d call this a strategic fit. Pringle: Straight Outta South Carolina. Hyped: Pringle gave her all during a promotion in the mid-innings of a day game vs. Buffalo and fans responded. This entry was posted on Wednesday, April 27th, 2016 at 1:34 pm and is filed under Sports. You can follow any responses to this entry through the RSS 2.0 feed. You can leave a response, or trackback from your own site.